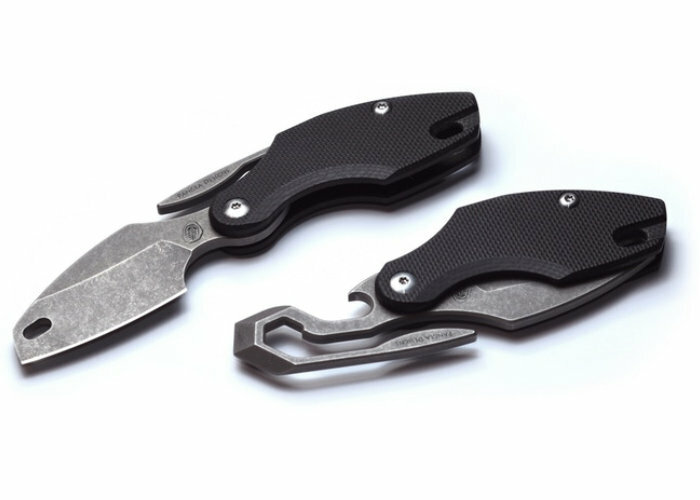 Developed from previous designs Michael Dickson and the development team at Pangea Designs have unveiled a new EDC keychain knife in the form of the Prylobite. The pocket keychain knife has been designed to offer a multifunctional compact folding knife for your everyday carry. The Prylobite folding mechanism is based on the traditional “friction folder” knife design. Simple and effective, the knife uses no lock or detent to hold the blade open or closed. But just the friction of the knife pivot itself, watch the video below to learn more about its unique design and features. “The Prylobite is an evolution of our first Pangea Designs product and fan-favourite, the Pickpocket suspension clip/bottle opener. The Prylobite combines the convenience of our original keychain suspension clip, with the resourcefulness of a pocket knife, bottle opener, prybar, and bit driver into an ultra light, compact design that is sure to become an essential part of your EDC. The Prylobite EDC keychain knife is now available to back via Kickstarter with earlybird pledges available from $99 or roughly £77. If the campaign is successful in production progresses smoothly worldwide deliveries expected to take place during July 2019.